Do you enjoy trying new plants in the garden? 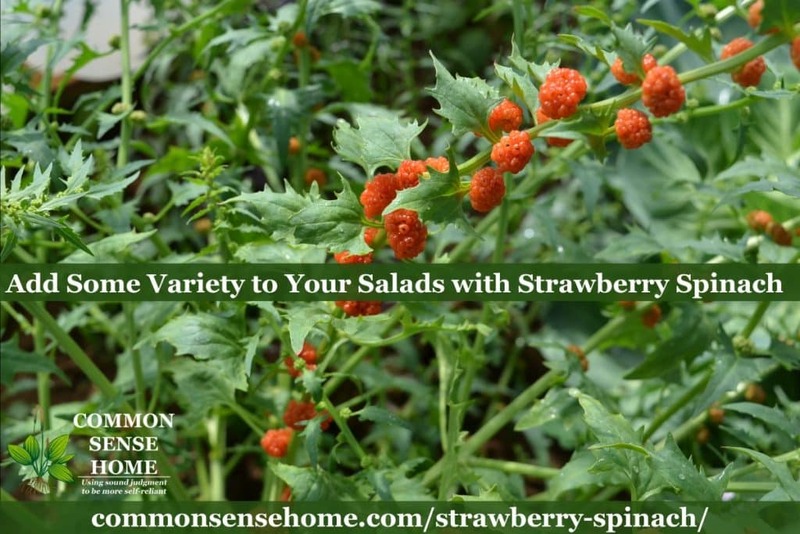 Strawberry spinach (Chenopodium capitatum, Blitum capitatum) is a fun edible that I've enjoyed in my garden for many years. Both the leaves and berries are edible. I usually eat the younger leaves fresh in salads, and use the older leaves for cooking. The berries are bland, but add some texture to summer salads. 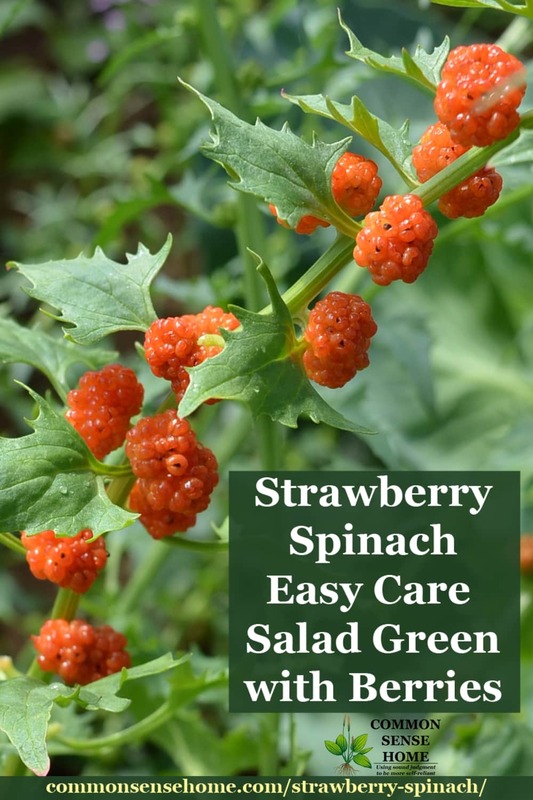 Click here to buy strawberry spinach seeds. 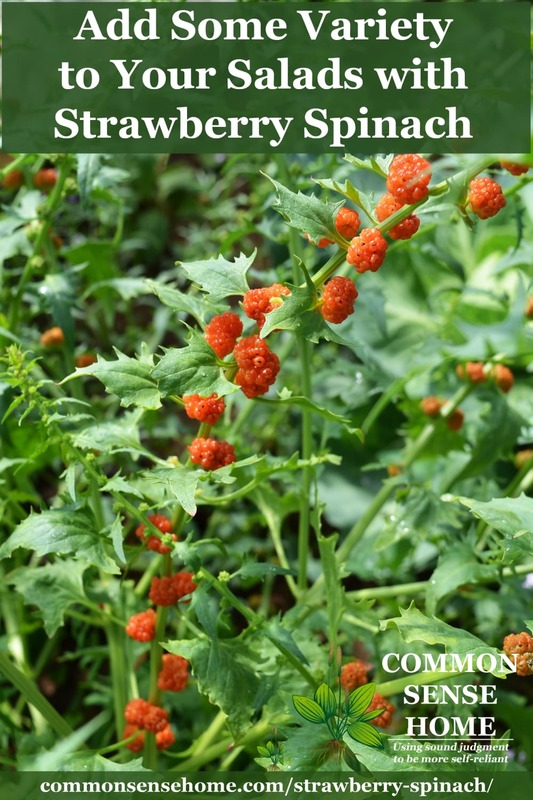 Strawberry spinach is also known as Blite Goosefoot, Strawberry Goosefoot, Strawberry Blite, Strawberry Sticks, Beet Berry, Beetroot, Indian Paint, and Indian Ink. Wikipedia says, “It is native to most of North America throughout the United States and Canada, including northern areas. It is considered to be endangered in Ohio. It is also found in parts of Europe and New Zealand.” This is interesting, since I've never seen it in the wild, but then again it mentions that it prefers “moist mountain valleys”, and I've never lived in one of those. 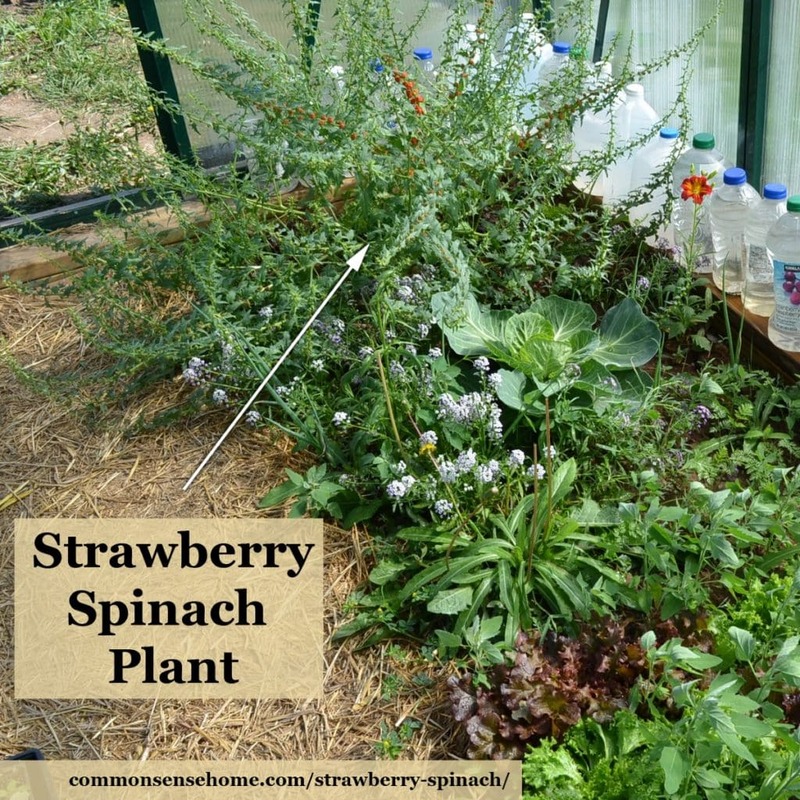 How do you Grow Strawberry Spinach? I had the best luck lightly sprinkling the seeds on the soil surface (direct seeding) and scratching them in just a bit. Some folks have mentioned that strawberry spinach resents transplanting, and since it has a tap root, this would make sense. I only planted it two years. Now it volunteers around the garden each year, and I just keep the plants that are convenient. It received mostly neutral reviews on Dave's Garden, although one member called it “a real weed” because it readily seeds out. Me, I like free food, so I don't mind this habit. (You could dead head if you don't like volunteers.) Rich soil and ample water will give the best growth and plumpest berries. What Does Strawberry Spinach Taste Like? The leaves taste a lot like mild spinach. As I mentioned above, you can eat them cooked or raw. The berries are bland and mildly sweet – quite similar to mulberries – with pronounced seeds. One would not mistake them in flavor for actual strawberries. The plant is high in vitamins A and C and lutein. Many years ago, an enzyme (an oxidase) that breaks down oxalic acid into CO2 and H2O2 was discovered and found to be naturally present in spinach leaves. However, nitrate, which can also be present because of the use of common nitrate-based fertilizers, inactivates the enzyme. Oxalic acid is even needed by our body for many functions (including peristalsis), and plays an important role in colon health, so much so that when it is not gotten through the diet, the body synthesizes it from ascorbic acid. When you cook the spinach the heat crystallizes, destroying it, the acid particles making them salt atoms, then the crystallized particles you obtain called oxalate bind with other salts such as calcium and potassium and they become stones. The calcium becomes unavailable and stones are therefore created. Therefore, it's not the oxalic acid that bind with other minerals making them bio-unavailable, but oxalates that are only formed when heat destroy and then crystallize the acid particles. The article provides a lengthy discussion of the pros and cons of oxalic acid. I encourage you to take a look, especially if you are plagued with kidney stones. 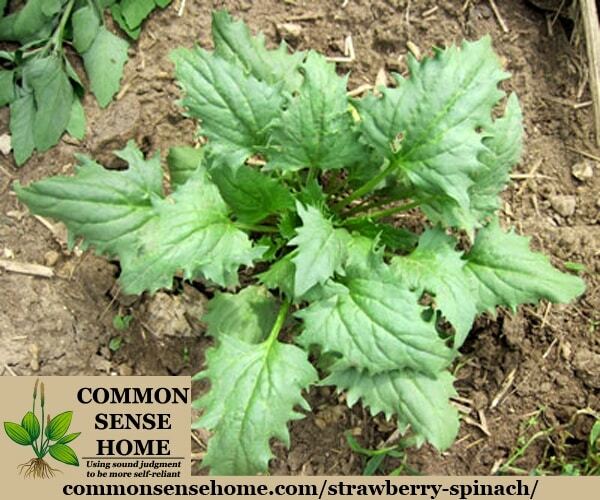 What Does Strawberry Spinach Look Like and How Big Does it Grow? 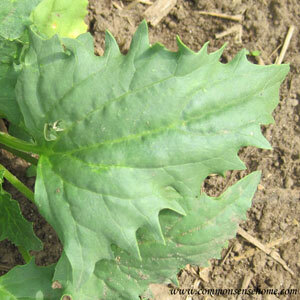 The plant is low growing, forming a rosette before shooting up flower stalks that produce the berries. Most of mine don't get more than a foot across and foot tall. This year in the greenhouse I had an unusually large plant, spreading about three feet in diameter and two feet tall. Individual leaves are triangular and symmetrical, with toothed edges. The berries appear on stems that are raised above the foliage. They start out small and green, and become larger and turn to more red as they ripen. The darkest berries will be the sweetest. You can clip an entire stem or just snag a few berries at a time – your choice. The berries get up to about one half inch across, and the seeds add a little crunch. Some people think they're great and some people don't care for them at all. They raised quite a stir when I gave out samples at the farmers market a couple years ago. I hope you give this unusual edible a try. If your garden is anything like mine, you'll be able to enjoy it for many years to come with little or no additional work. Originally published March 2013, updated May 2016. Interesting! I’ve seen this in my local seed company’s catalog before and contemplated ordering it – but I’ve never heard anyone mention it before. Thanks for the info. I have one that I transplanted and is doing great! I just didn’t know that it was going to bolt like that and produce berries. I was researching because mine has bolted, with the start of berries and I was checking to see how I could use it. Thank you for your help! The leaves are amazing in salads and we put it n our sandwiches too. It’s yummy!! If you leave some of the berries to ripen completely on the plant, they are likely to reseed and provide you with plants in years to come. I only planted mine once and have been enjoying it around the garden ever since. I didn’t know anyone would plant this. It’s a wild weed here. But I think after reading this I should save some seeds next time and move it around a bit. Thanks for the post. Sharing this today on FB. lol – one person’s weed is another’s salad. I haven’t planted it for years, but I enjoy the volunteers each season. Wow! I’ve been trying to identify this plant all spring, and just now hit the magic combination of words in google that brought up a picture of your little plant… the first I’d seen anywhere! Thanks so much! We moved to a house with extensive gardens and this had volunteered itself in several beds. I kept several to let them grow out. I also think the roots of this plant are interesting. Pulling young plants, you find a pretty large pinkish root with a pleasant smell… almost radish like. Will begin using the berries and leaves in salads today! Thanks again. You’re welcome. I planted them once, and they have popped up around my garden ever since. They’re easy to pull where not wanted, so I enjoy them. Re: oxalic acid…does this mean that those prone to stones or kidney issues should avoid spinach, especially cooked? It may be a problem, yes. If I remember correctly, there are different types of kidney stones, so an issue for one person might not be an issue for another. Definitely something to research. I believe more than 50% of kidney stones are calcium oxalate, so worth researching. Absolutely. No sense trying to “eat healthy” only to find out that in your case something is counterproductive. Appreciated all the info on strawberry spinach–I bought a plant, and now know more about them, and look forward to having more next year! The one that volunteered my greenhouse this year is simply gorgeous. It’s completely loaded with huge strands of bright red berries. I need to snap a few more photos before it finishes up and the other plants take over the space. My husband recently had some work done in our backyard, moving a hillside of sand and rock. I was looking around and found this plant growing all over the place, its very unusual, will it come back next year? Odds are that it will self-seed and show up again next year. I planted mine once and have had it pop up ever since. Have you tried making jelly with the fruit? I say jelly instead of jam because of the seeds. They’re pretty bland, with a low sugar content, so no, I haven’t tried it. Too many other yummy things to eat. I didn’t have high germination rates to start, but I have had volunteers show up each year since I originally planted them. I like trying new things in the garden, too. You never know when you’ll find another “must grow” plant. Can Alaska straberry spinach be frozen, or the berries part frozen. I would love to be able to eat in December. I don’t see why not, although I suspect the bland flavor would be made even more bland by the freezing process. I’d try it out and see if you think it’s worth the effort. Then you’ll know for sure if you like it or not. I’d freeze like blackberries or raspberries – first on a tray until hard, and then packed into the container of your choice so you can pour out as many as needed. Can you grow strawberry spinach in a pot? Also can you grow it in an herb garden? Thanks! Yes to both, as I’ve had mine self sow in both places. It’s not an aggressive grower, so I’m happy when I see a random seedling pop up in the garden.